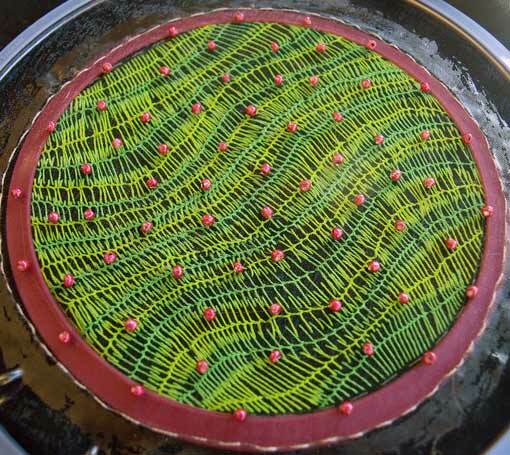 This is the double-layered work featuring fluorescent threads that I have been working on. You may remember that I described an image shown to me at QBI by Lavinia, Dr Adam Hamlin's PhD student who is researching neurogenesis after ischemia in mice. The new cells were marked with a green fluorescent protein, while other structures were marked with a pink fluorescent marker and imaged separately. When the two images were laid over each other, the relationship between the new brain cells and the brain activity became clear.